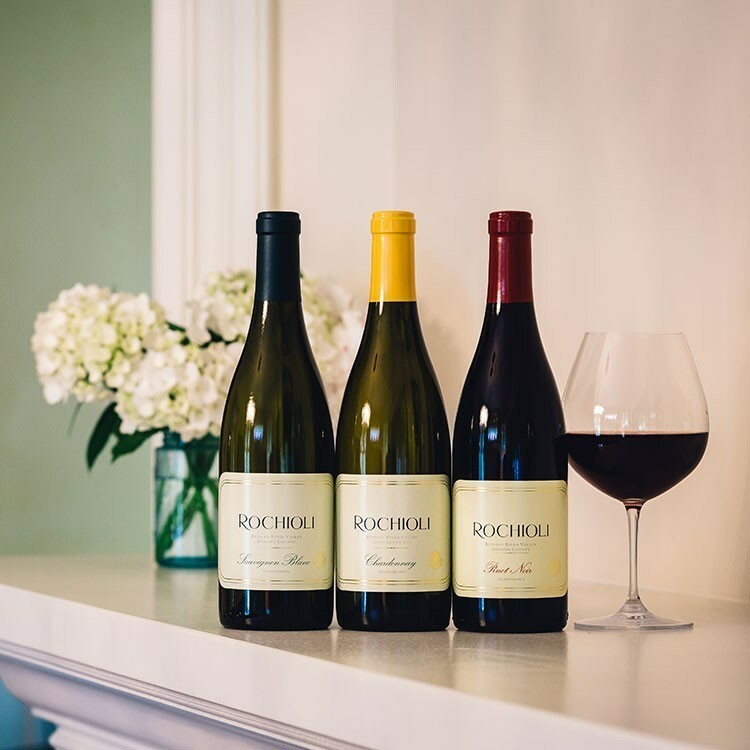 With three generations of dedication to the land, Rochioli Vineyards and Winery has earned the reputation as one of Sonoma County's finest wineries. Our family crafts renowned, terroir-driven wines built on a foundation of superb fruit. We are fortunate that our wines are always in demand, always revered and always rated among the best varietals to be sought anywhere in the world. This commitment to quality is unwavering and our promise to everyone who uncorks a bottle of our wine. The Estate Wines are a precise, hand crafted blend of the single vineyard sites on our property. Each single vineyard that is blended into the Estate wines are carefully selected to represent the unique quality and character of Rochioli Vineyards. The Estate Wine Selection is available in our tasting room and includes a silky-smooth, fruit-forward Pinot Noir; a rich, opulent Chardonnay; and a tangy, food-friendly Sauvignon Blanc. Because of the diverse terroir in our vineyards, we are able to produce distinctly different wines from the same varietal by keeping each plot separate throughout the winemaking process. For our Single Vineyard Estate wines we hand-select the highest quality grapes in each of our vineyard sites and produce small quantities of wine in this way. These wines are made available on a limited basis to customers who are on The List. The List is currently full. If you are interested in signing up we will notify you when space becomes available. Elegant and beautifully balanced, this Pinot Noir has aromas of ripe cherry, vanilla and a hint of savory herbs, while on the palate it is juicy and refined with a hint of dusty cherry. The wine has a big rich mouth-feel, silky tannins and a long finish. This wine expresses classic Rochioli character. With aromas of green apple, lemon and vanilla, this is a bright, crisp Chardonnay with just a touch of oak. Bold and juicy on the palate, with a touch of minerality and firm acidity, we think this is a fine example of the unique characteristics of our property. This wine is a blend of three vineyard sites including our rare and special clone of Old Vine Sauvignon Blanc. With aromas of passion fruit, melon, and citrus tones this is a light and sophisticated Sauvignon Blanc.